The Washington Monument won't be the only D.C. landmark covered in scaffolding for the next few years. Congress plans to spend $60 million to fix more than 1,000 cracks in the United States Capitol Dome. The restoration, which will begin in November, will take two years to complete, an overview from the Architect of the Capitol (AOC) states. Age and weather caused the cracks and deficiencies. 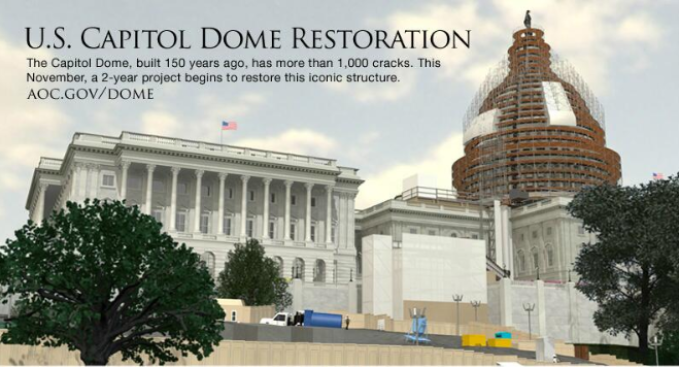 A scaffold system will be installed "from the base of the Statue of Freedom down to the Dome Skirt," the AOC said. Like the Washington Monument, the scaffolding will be lit at night. The majority of work to the dome will be done at night and on the weekends to reduce the amount of disruption. The 150-year-old, cast iron dome was last restored more than 50 years ago, between 1959 and 1960. Dome tours will not be offered during the restoration. The budget for this phase of the project is $59.55 million, the AOC wrote on a FAQ page for the project. The money includes a "recent award for construction, as well as contingency costs and project support." Repairs on the Washington Monument, which was damaged during an earthquake in 2011, are expected to be completed in spring 2014.